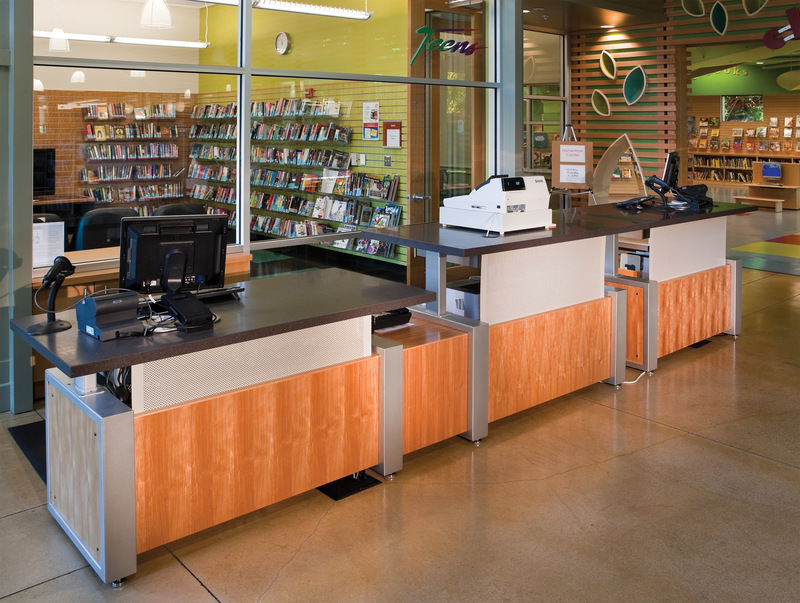 As they started looking at new ways to serve their customers, the success of the San José library model caused circulation to triple while there had only been slight increases in staffing. This made it imperative that staff had the ability to easily provide a wider range of services to a greater number of customers without sacrificing service. 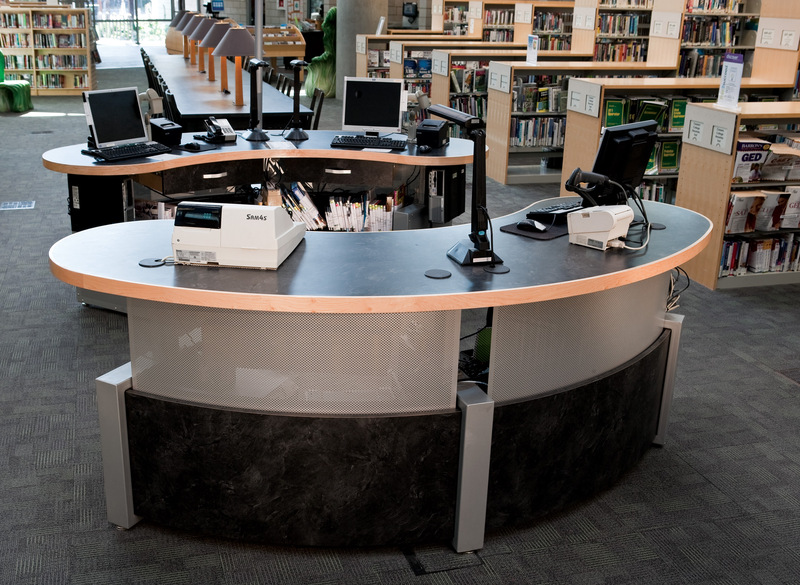 Working with Demco designer, Stephen Gower, Ruth Barefoot and other staff members from the San José system were able to tailor solutions for each of their libraries that met the needs of each space using the TechnoLink® Desk System. Special attention was paid to creating collaborative work spaces that could be shared by customers and staff and would be flexible in use. Storage needs were taken into consideration through the development of special drawers, shelves and cabinets. Tops and finishes were coordinated with existing interiors to ensure that pieces would be aesthetically appropriate and attractive in addition to being highly functional. With the modular nature of these pieces, they are not permanent fixtures in the library and can be moved and reconfigured throughout the life of the library as space and service needs change. Long seen as one of the most innovative library systems in the country, the San José Public Library has demonstrated time after time that there are creative new ways to deliver service to their customers. Using the general principle of “give the customer what they want,” the system has created dynamic, destination oriented spaces that draw constituents in and keep them coming back. A comment on their web page reinforces this by saying, “We have been listening to our customers, and our new model provides an experience of comfort, convenience, choice and excellent customer service. It’s the San José Way!” The San José Public Library system serves a population of over 1 million constituents and is the largest system between Los Angeles and San Francisco. The system currently consists of a main library and 22 branch libraries with an additional branch under construction. 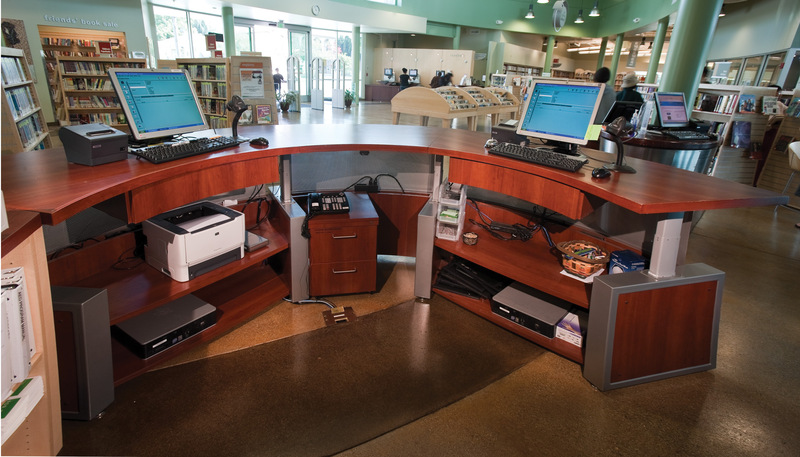 Demco was first approached by Libraries-The San José Way Manager, Ruth Barefoot, because she was interested in adjustable height desks that could provide for the different ergonomic needs of staff and could also take into account the different needs of library customers. It was quickly discovered that the commercially available solutions available from other vendors weren’t flexible enough to meet the needs of the various work areas that were desired. 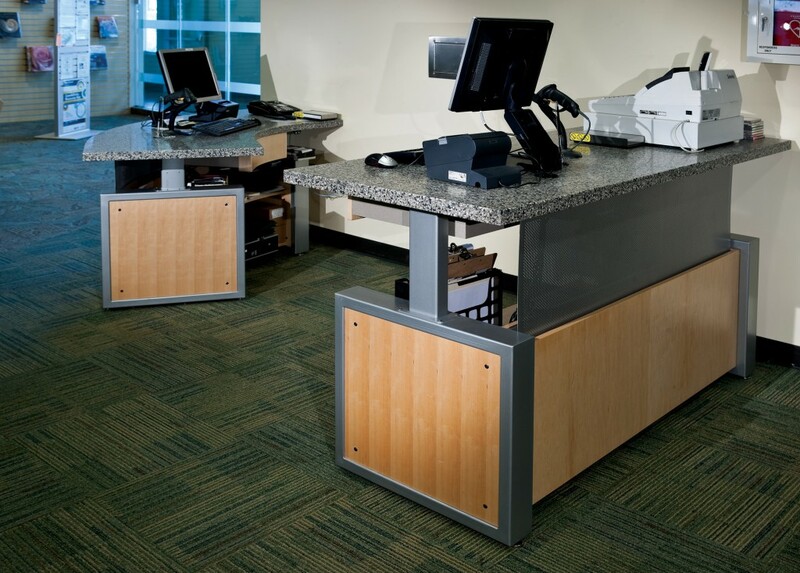 Working with Demco designer, Stephen Gower, Ruth and other staff members from the San José system were able to tailor solutions for each of their libraries that met the needs of each space using the TechnoLink Desk System. Special attention was paid to creating collaborative work spaces that could be shared by customers and staff and would be flexible in use. Storage needs were taken into consideration through the development of special drawers, shelves and cabinets. Tops and finishes were coordinated with existing interiors to ensure that pieces would be aesthetically appropriate and attractive in addition to being highly functional. 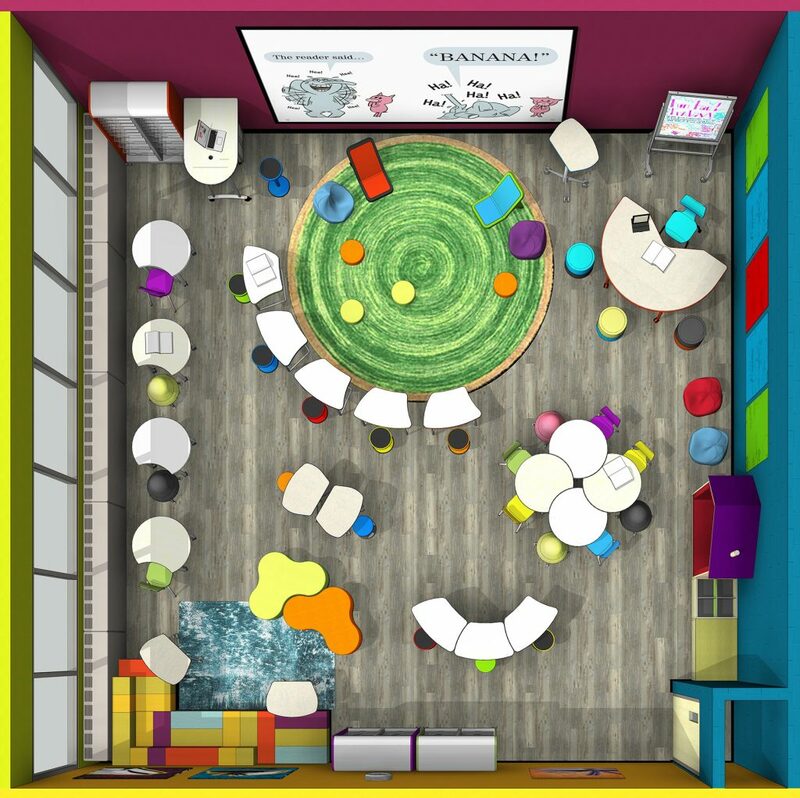 With the modular nature of these pieces, they are not permanent fixtures in the library and can be moved and reconfigured throughout the life of the library as space and service needs change. 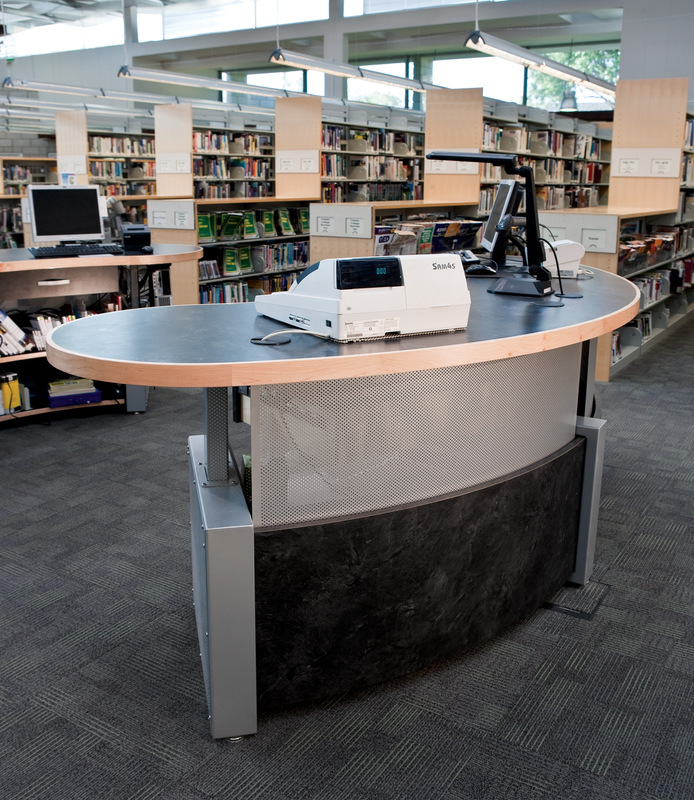 Our work with the staff at the San José Public Libraries helped to further develop the TechnoLink line of products into an offering that meets the needs of today’s libraries. 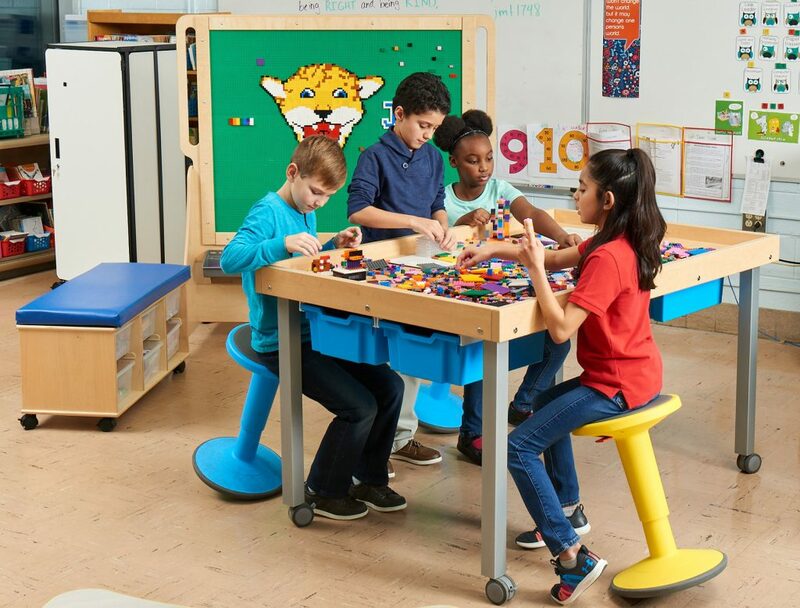 The constant evolution of the product and the customizable nature of the pieces serve to make it a highly desirable system for any library environment. The San José library system had many newer or newly renovated libraries with attractive spaces that were designed with an exciting bookstore feel and keeping customer convenience in mind. The element that they weren’t satisfied with was their service desks. 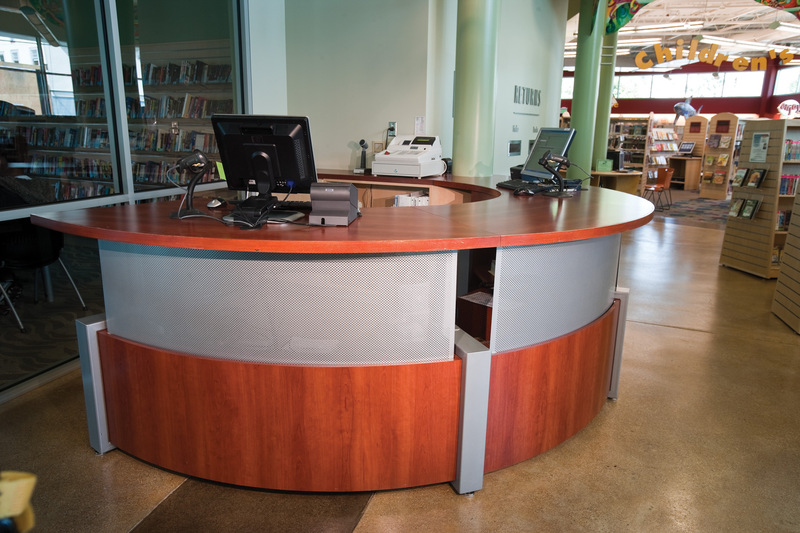 They wanted smaller service points in their libraries that could accommodate a variety of services. Staff were moving to a roving service model that didn’t require as much space behind a service desk but still required some quick reference materials and a space where services could be consolidated. 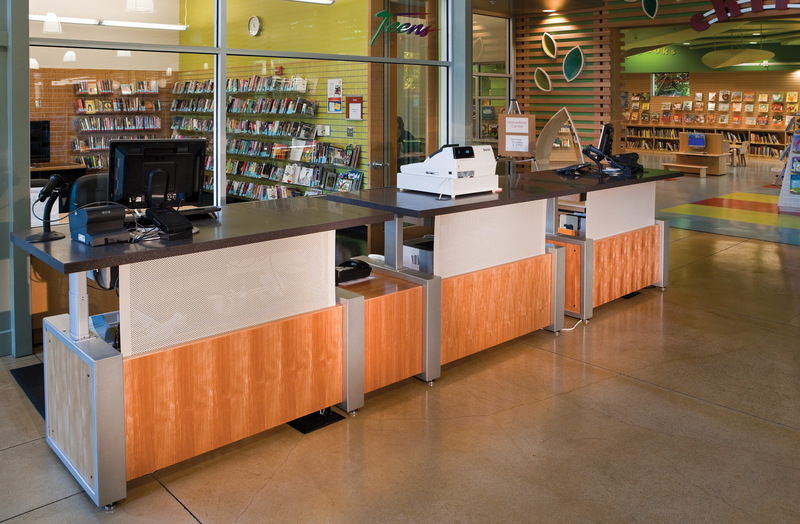 The needs of each space varied dramatically and the San José library staff wanted something that could be modified to the appropriate size and function as needed. Staff comfort and ability to provide top notch service were also considerations. 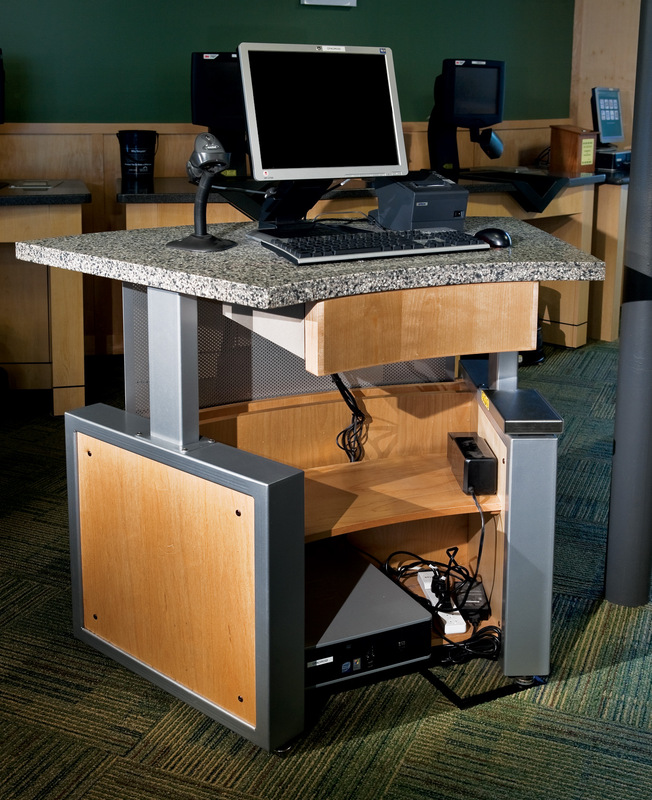 With fewer, smaller service points, work stations needed to be able to accommodate the different physical needs of both staff and customers without creating specialized areas for each individual. In addition, the approach had become more collaborative so spaces where customers and staff could work comfortably together or in a self-directed fashion rather than across an expansive desk were more important. The success of the San José library model caused circulation to triple while there had only been slight increases in staffing. This made it imperative that staff had the ability to easily provide a wider range of services to a greater number of customers without sacrificing service levels.